The Iceman had laid down some of his equipment during his stay in the rocky gully, which was free of ice at that time. His bow, axe, a backpack, and a birch bark container were on another ledge and his quiver was on a stone slab. The rest of his equipment was on his person. The Iceman Carried Provisions in Two Birch Bark Containers. The axe was the first piece of the Iceman's equipment to be discovered. The haft of the axe is make of yew wood. Almost three-quarters of the blade are embedded in the shafting fork, held in place with birch pitch. The blade is 9.3 cm long, trapeziform in shape, and made of almost pure copper. 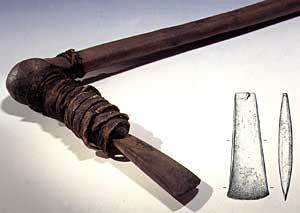 The Tisenjoch Axe is the only complete prehistoric axe found to date. A completely preserved 1.82 m long bow-stave made of yew wood is the largest piece of equipment discovered. The Iceman's bow is clearly an unfinished piece and not yet functional, showing signs of his work in progress. The Iceman's completely preserved quiver was discovered on a stone slab about 15 feet from the corpse. It was composed of a rectangular chamois hide bag. The piece of hide was seamed together lengthways and along the lower narrow side. The quiver contained two arrows that were ready to shoot and twelve rough shafts make of shoots of hard viburnum sapwood. 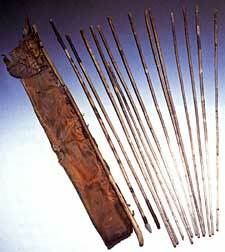 The heads of the arrows are made of sharpened flint, and had been glued with birch tar and bound on using string. The quiver also contained tips of four stag antlers that were tied together with strips of bast. A bent antler point was probably used by the Iceman to skin and gut animals. The flint dagger, measuring approximately 13.2 cm, was discovered near the mummy. The dagger has a small triangular flint blade, the handle was made of ash, and a string was attached to a notch at the end of the handle. The sheath-like scabbard is made of knotted lime wood bast. It is presumed that a leather eye on the side allowed the sheath to be attached to the Iceman's belt. One of the more unusual objects included with the Iceman's equipment is a retoucheur. This tool is made of a section of stripped lime tree branch that is straight on one end and sharpened at the other end. A rod was stuck into the medullary canal at the sharpened end. Analyses of the rod shows that it was made of stag antler and had been hardened by firing. The retoucheur was used for the intricate work in the production of flint tools. When the head of the tool became blunt, it could be sharpened like a pencil. The Iceman's retoucheur is the only known example of its kind. Several pieces of wood were found on a rocky ledge near the axe and bow. These pieces of wood formed the frame of a backpack. Since the backpack emerged from the melting snow sooner than the body, it was exposed to the effects of sun and wind, deteriorating its condition. An exact reconstruction of the backpack is no longer possible. The remains of a net were also discovered at the site. The rough mesh was made of lengths of grass. The Iceman's net was probably used to catch birds. On two strips of hide attached to his clothing, the Iceman carried spherical walnut-sized forms made of birch fungus. This birch fungus served a medicinal purpose; the active ingredients of the tree fungus stop bleeding and act as a disinfectant. 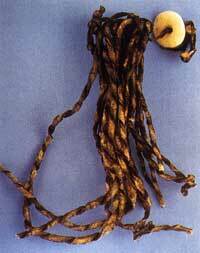 The only object found that could be described as decorative or as an adornment was a tassle with an attached marble bead. The hole in the bead is threaded onto a thong, holding together a bundle of spiral-twisted strips. This hide strip is decorative and possibly served as spare parts for this man of the Copper Age. One birch bark container was found next to the mummy while a second container was discovered near the backpack. The second birch bark container was blackened on the inside and contained maple leaves embedded with spruce and juniper needles. Particles of wheat, einkorn, and charcoal were also found. The contents suggests that this container was used to carry embers, and that the leaves were used as insulating material. The chlorophyll content shows that the maple leaves were freshly picked. Harvested between June and September, it can be concluded that the Iceman died in summer or early autumn. The Iceman carried a total of 18 different types of wood, using the most appropriate type of wood for each tool. It is apparent that the Iceman had a wide knowledge of the natural resources that were at his disposal, and how best to use them.